This Stage Fort Park on location photo shows a family portrait session. This park is located at Stage Head in Gloucester Massachusetts. 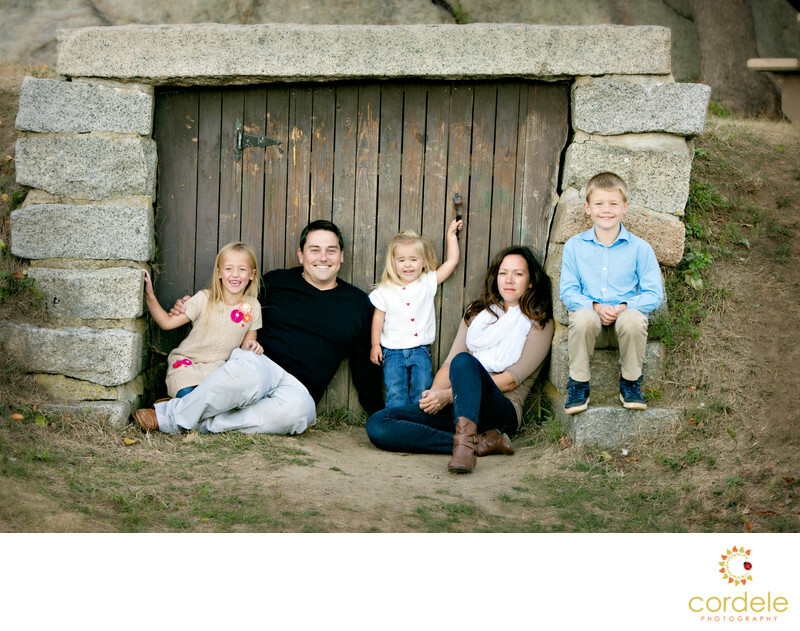 The location brings a lot to offer from Beach, to playground to old bunkers and incredible views of the coast for Family Portrait sessions. It is located on Boston's North Shore and is near the Gloucester Fisherman Memorial and across from Stage Fort. There is also a dog park near by. Stage Fort Park is where the first settlers of Gloucester arrived. What is great about this location is there is so much to photograph. They have the beach, the bluff, the bunker, the canons. If the kids are getting restless you can also go over to the playground. You have hidden places and wide open spaces. It is said that the large rock here is part of an ancient Tribe! My favorite placed to shoot is over looking the harbor by the old bunker door seen in this photo. Location: Stage Fort Park, Gloucester MA.